Dave's Services A/C & Heating is proud to serve the Tipp City community! In the years we have been a customer of Dave's Services we have always been very satisfied with their performance. Always satisfied with their service and friendly technicians. I would highly recommend their work. Very happy with Dave's Services. Jim was very thorough in designing the right system for my home while listening to what features were going to be important to me. The guys doing the installation were very polite, professional, and left the work-site in better condition than they found it. JJ even found a few things that others might have left as 'good enough' but he wanted to make better. Great job all around! Techs are knowledgeable, courteous and thorough. Would always recommend daves services. However try to use them during business hours cause that overtime fee is quite painful. Even tho they are still great people and a good company. Dave himself did work in my moms ice cream store back in the 80's. I have used Dave's Services for several problems with different furnaces. They are always very quick to respond, find and fix the problem with optimal speed and reasonable prices. I would not consider using any other heating service in this area. Can not say enough good things about this company!!!! Always satisfied with service from Dave's. Eddie is an awesome technician. Always polite professional and informative. As always, I love how professional and knowledgeable he was! He also has a way to relate to me that provides info that makes my life easier! Service was on time as scheduled and very professional. Very professional and thorough as usual. Eddie left the area spotless and throughly explainined what he did and why it needed to be done. J.J. was courteous, knowledgeable, and professional. He was diligent in his task and took extra time to do the job properly rather than rush through to get done in the time quoted to us. An awesome company. We have recommended them and will continue to. Not happy that I was charged for this service. We have an agreement for biannual service calls. You did not schedule a pre summer inspection. If you had, the problem would have been discovered at that time and we wouldn't have had this service call. I'm happy with how quickly you did respond and take care of the problem. Wonderful service from start to finish. Everyone we interacted with was very helpful and professional. Definitely appreciate the excellent service with quick response time !! Plan to use Dave's services in the future. Pricing is a definite "Thumbs Up "
Received the usual excellent service. Very dependable, knowledgeable and courteous. Very affordable and will give many solutions and costs if there is an issue. Dave's Services is TOP NOTCH in all areas!!! I had an emergency with no heat on a very cold day. They not only got there for a service call (within hours) but spend considerable time tracking down a possible problem. Since this is a rental and I am out of town they spent a lot of time explaining to me the possibilities and the fact it might not totally fix the furnace. Sure enough it quit again that night so Dave himself spent several hours the next day trouble shooting again until he solved the problem. Not only were they timely but spent time explaining to me the situation with the furnace. They were very professional and helpful. The gal on their phones is GREAT-very "soothing"at a time when its stressful because of no heat & very cold. HIGHLY recommend this company!! Appreciate the Excellent Service on short notice !!! Very courteous and prompt service! Dave answered all my questions and explained what he was doing. His shoes were covered to protect my floors. My experience was great and I would recommend their service to anyone in a heartbeat! Great friendly service when I need it. So far so good, work is not yet complete. Definitely appreciate the expedient service and Knowledgeable personnel !!!! Serviceman was very friendly and helpful. We received a phone call to let us know he was on the way. Let me know about a bush problem that we need to correct. Promised to send out a book on our temp. control unit. Always satisfied with the service I get from Dave's Services. I find the technicians courteous and informative. I have never experienced anything but friendliness from the receptionist who makes my maintenance appointments. Always goes out of their way to accommodate me by working around my schedule. And, I really appreciate that I get a call when my technician is on their way. Always satisfied with service and friendliness of technicians. I feel I can be assured that my A.C. and furnace have been checked thoroughly and will perform the way they should. About Tipp City, OH - Happy to be your hometown Heating & Air Conditioning Contractor! 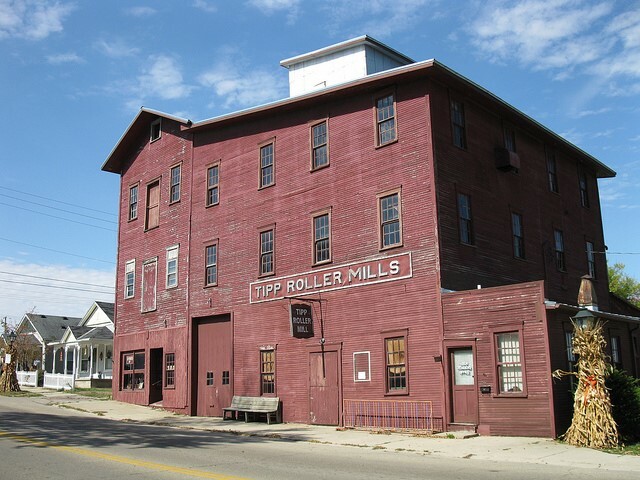 Tipp City is a charming historic town with a population around 10,000 citizens. It is located in Miami County, Ohio and is neither huge nor tiny. This makes it an ideal place for those who want the convenience of the nearby city of Dayton with a slightly rural feel. This community is filled with sunshine and warm breezes in the spring and summer. But, wait! Do you love snow, ice and fall colors? Well, you are in luck, spring and summer give way to the lovely fallen leaves of autumn and the crisp, cold weather of winter. Are you a history enthusiast? Check out Overfield Tavern, one of Ohio's oldest taverns, located in the nearby town Troy. It’s not a bar anymore, but a museum these days. This little piece of Ohio’s past is a great place to warm up in the heated indoors while learning a little bit about native history. You can also make the short trip to Sidney to check out some of their important historical buildings such as the Second Empire courthouse and the Gothic revival Monumental Building. In addition, the People's Federal Savings and Loan Association is a national historic landmark.